Wherever I have traveled, one experience has struck me again and again. The best known and most advertised cultural or natural treasures usually fail to affect my emotions. Stuck in the tourist assembly-lines leading to them, I am constantly disappointed by the crowded, noisy and commercial environment that surrounds them. Therefore I like the almost unknown and hidden treasures like those to be found in plenty in Slovakia. What would you say to a little Taj Mahal, for example? You can find one in the Gemer region in southern Slovakia. 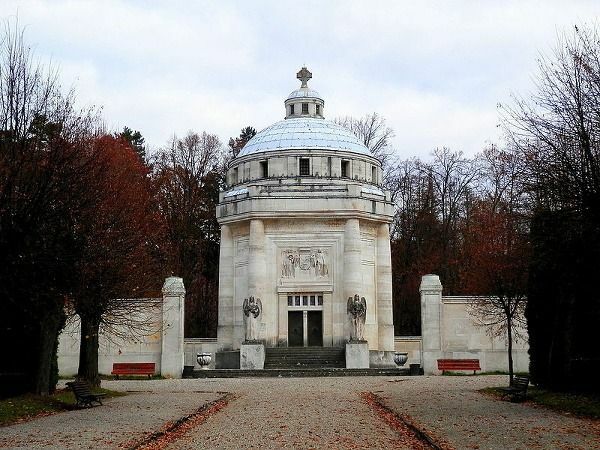 It is a beautiful Mausoleum built in the secession style, and it too has a love story connected to it. The Mausoleum was built in 1904 by count D. Andrássy for his wife Františka. She was “only” an actress and thus not accepted by the Andrássy family, but her aristocratic husband ignored every obstacle and decided to show the world that love has to win. The Mausoleum is artistically decorated with different marbles from every corner of the world in a whole spectrum of colors rather like the much larger and well-known Taj Mahal in India. The love of these noble man and an “ordinary” woman in Gemer, who lie beside each other in the center of the Mausoleum, was so great that even their beloved little dog was included in this memorial and his statute is outside of Mausoleum. Only a few kilometers away stands the Andrássy family’s medieval castle, Krásna Hôrka, opened to visitors already in 1906. Another few kilometers on and you may visit the Andrássy´s family hunting manor in Betliar, set in a large park that´s home to exotic plants, artificial waterfall and romantic park-buildings. It is known that married couples live longer than individuals. And right here, in the middle of Europe, we have proof that a happy and satisfied marriage contributes to longevity. You can convince yourself of that. In the Betliar manor there is a picture from 1552 and a married couple. He was called János Rovin Ratz and his wife Sarah. She was supposedly living 164, up to 172 years old. They claim to be a satisfied couple for stunning 147 years. The whole region of Gemer is like a park. There are no big cities, and Gemer is surrounded by three National parks: Slovenský raj (Slovak paradise), Slovenský kras (Slovak beauty) and Muránska planina (Muráň Plain). Because in June it is already warm enough outside, you can enjoy another hidden treasure – Ochtinská Aragonitová Jaskyňa (Ochtinska Aragonit Cave). Due to the specific hydrogeological conditions under the Revúcka vrchovina (Revúcka Upland) you will be amazed by the unique underground decorations that will remind you of the Mausoleum— but this one created by Nature. Another nearby cave, unique in the world, is Dobšinská ľadová jaskyňa (Dobšinská Ice-Cave), adorned with 110 000 cubic meters of ice. Slovakia is rich in spectacular caves, and 21 are open to visitors. Demänovská ľadová jaskyňa (Demänovská Ice-Cave), one of the first discovered caves in the world, was mentioned in official documents already in 1299. Much later this cold place gave its name to the hard spirit that may make you warmer, Demänovka, a liqueur from natural Slovak herbs with a nice bitter taste. In late afternoon on the terrace which gives a view of the woods and valleys around, Demänovka goes well with the special Slovak cake “bublanina”. This “bubble-cake” with sweet pastry is full of cherries fresh from the market. It may remained us of the great love that built the Mausoleum – sweet, but full of hard stones.